The Washington Memorial National Carillon evolved from a smaller collection of fourteen bells dedicated in 1926. Construction of the bell tower began in 1941 and was completed in 1953. An inspiration of the founder of the Chapel, the Rev. W. Herbert Burk, the Washington Memorial National Carillon evolved from the Star Spangled Banner National Peace Chime, which consisted of fourteen bells—one for each of the thirteen colonies and one representing the “National Birthday.” This fourteenth bell bears a star and the name of every state in the order it came into the Union. The first fourteen bells ranged in weight from 3,500 pounds to 225 pounds. 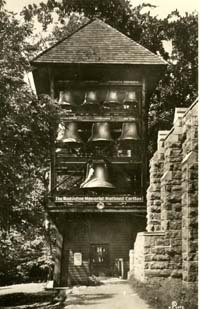 The chime was dedicated on July 4, 1926 in commemoration of 150 years of American independence. The chime had been intended only as the initial step in securing enough bells for a National Carillon. Fourteen more Meneely bells were added in the late 1920’s and 1930’s and were assigned in the order of the individual state’s population. These lower 28 bells were cast by the Meneely Bell Foundry of Watervliet, New York. established the Washington Memorial Committee in 1941 to raise funds and build the new tower and complete the carillon. The DAR undertook not only the construction of the tower but also included an honor roll for all Revolutionary War soldiers and one open to all men and women serving in World Wars I and II, and several special memorials such as the State Seal of Pennsylvania, the Keystone above the main entrance, and the DAR windows. In 1950, the construction of the new tower was resumed and took three years to complete. The lower 28 bells were cast by the Meneely Bell Foundry of Watervliet, New York. The upper 30 bells were cast by the Paccard Bell Foundry of Annecy, France. The tower and carillon were dedicated on April 18, 1953. The ceremony was followed by the Dedicatory Recital performed by our first carillonneur, Frank Péchin Law. The first musical composition played on the carillon was our national anthem. The first musical composition played on the carillon was our national anthem.